A fun, colorful tool for teaching young children about Gods creativity and his love for all children, near and far. 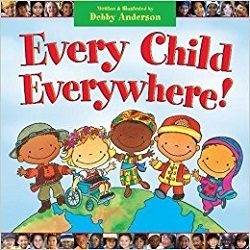 Every Child Everywhere! celebrates children as reflections of the joy and creativity of God. Bright illustrations and joyful narrative teach young children that though we are all different, uniquely designed by God, certain undeniable similarities unite us--things like play, family, and imagination.